Kurt Vonnegut says fiction is an art form unto its own. “All of fiction is a practical joke—making people care, laugh, cry or be nauseated or whatever by something which absolutely not going on at all. “Don’t worry about getting into the profession. Write anyway to make your soul grow. From interview: Vonnegut on Fiction. 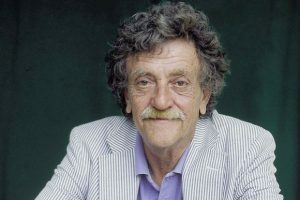 Kurt Vonnegut: This guesser or that one.